Whenever you install an application on an Android device, an icon is placed on the home screen that opens it when you activate it. 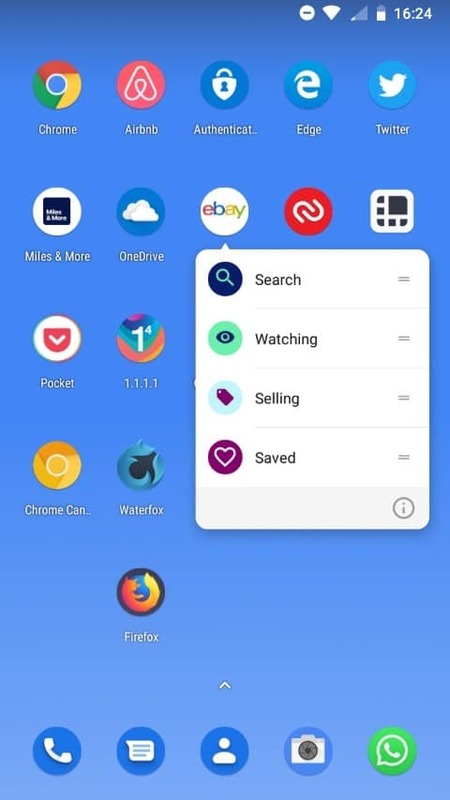 The application opens its default view by default; if you activate YouTube, YouTube's homepage is loaded, and if you select eBay, eBay's mobile homepage is loaded. While that is often exactly where you want to go, you may switch to another page often or even always when you open specific apps. If you are, for example, an eBay seller, you might select Selling whenever you start the eBay application on the Android device. Shortcuts, if supported by the application, may get you straight to the desired page or part of the application. The eBay application, to give an example, supports four additional shortcuts -- Search, Watching, Selling, or Saved -- that you may place on your home screen. Not all applications supports additional shortcuts; Google added the Shortcuts API in Android 7.1 and only some developers have integrated it into their applications. Custom shortcuts require Android 7.1 or higher as the functionality was introduced in that particular version of Android. Checking if an application supports custom shortcuts and adding them to the home screen if that is the case is a straightforward process. All you have to do is press on an icon for some time to display the available shortcut options. Some applications display nothing except for App Info when you do so; these don't use the shortcuts API and don't support custom shortcuts. Other applications may display one or multiple custom shortcuts. Tap on any of the shortcuts to open that particular page or feature at that moment, or long-press on the shortcut and drag the icon to another place on the home screen to create a custom shortcut. A tap on the custom shortcut opens the selected page or feature of the application on the Android device right away. There is no way, unfortunately, to find out if an app supports custom shortcuts or not other than long-pressing on the icon to display available shortcuts. Now You: Do you have another Android tip? Feel free to share it in the comments below. Some Android apps support custom shortcuts that you can place on the Android Home Screen; use our instructions to find out about that. You can also add a new widget and under Nova widgets select “Activity”. It will show you all these custom instances for every application. You will even find old easter eggs; on Android 8.1 I have the easter eggs from KitKat, Marshmallow and Nougat, and, ofcourse, the Oreo one. You’ll also be able to start an interface for some services, like Qulcomm’s assertive display (I guess that’s what they call it), which will allow you to disable the gamma (not brightenss) boost in bright enbironments – this worked for me on Android 8.0 but it no longer works on 8.1, sadly. The UI is there, but the toggle does nothing. Forgot to say, when you create the activity, if you tap on an application instance it will create that shortcut, but if you hold pressed it will just launch it, so you can check before what you are creating. No, Android does not place home screen shortcuts by default. That would be Apple iOS. Android places shortcuts to all apps in the App Tray.